British Santa | Jim Shore Ornaments Figurines | One Price Low Flat Shipping! 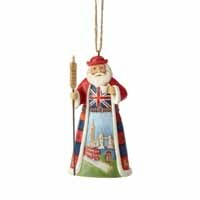 From the Jim Shore Heartwood Creek Around the World Santa Collection, British Santa Hanging Ornament. Made of hand-painted stone resin. Measures 4.5" tall. Comes with hanging cord attached and packaged in collectible Enesco Jim Shore gift box. Jim Shores Santas Around the World collection shines a light on holiday traditions of cultures near and far. British Santa enjoys a cup of tea while he holds a Tower of London staff, his robes hand-carved with royal crests and featuring famous traditional sights of Great Britain's capital city.